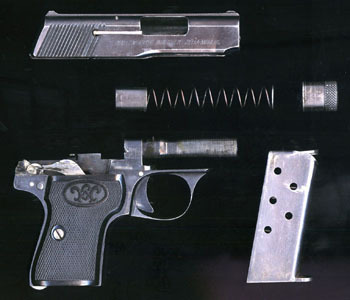 The Walther Model 1, while relatively successful, had a complicated takedown procedure and small parts that were liable to come loose and get lost. It was replaced with the simpler Walther Model 2, which was smaller and less top-heavy than its predecessor. A number of sources have maintained that production of the Model 2 began in 1909. However, the 1911 ALFA Catalogue of Arms and the Outdoors lists only the Model 1. The patent application for the method of retaining the slide was not filed until 22 October 1911, and the patent for the automatic sight was not made until 8 January 1913. So the Model 2 was probably manufactured from 1913 through part of 1915, followed by the Model 5 which was likely produced from 1915 through 1923. I’m not certain about these dates, but we can certainly say that sometime in the middle of World War I Walther made some cosmetic changes to the Model 2 and renamed it the Model 5. Internally and externally the two guns are nearly identical. 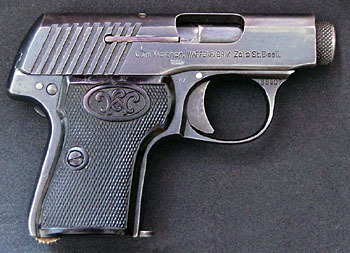 The Model 2 was available in two variants. The basic design features an internal hammer, a fixed barrel with concentric recoil spring, a side mounted extractor, and a chequered bayonet-style bushing at the front that secures the slide. The ejector is a small piece of metal on the left side of the frame, about 4 mm long, that is folded over into the path of the cartridge rim when the slide is almost all the way to the rear. The magazine holds 6 rounds. The manual safety lever locks the sear and hammer, but does not prevent the slide from being pulled back. Both variants are marked identically. The Model 2 is marked on the left side of the slide in all-capital sans-serif characters SELBSTLADE-PISTOLE CAL.6,35.WALTHER’S-PATENT with the Walther banner beneath it. The right side of the slide is unmarked. Later guns (above at least SN 25104) have an inscription on the right side of the slide in sans-serif characters, which reads WAFFENFABRIK Zella St. Blasii. The Model 2 serial number is on the right side trigger guard bow. There are nine angled square cuts at the rear of the slide, each about a millimeter wide, which serve as a gripping surface for retracting the slide. The standard grips are checkered hard rubber with the superposed CW logo in an oval at the top. On some guns, the oval on the left grip has “Caliber 6,35” instead of the CW logo. The standard finish was blue, but nickel was available by special order. Wood or ivory grips were also available by special order. I have located two patents for the Walther Model 2. Carl Walther filed for a patent on the method of retaining the slide with a bushing at the front on 22 October 1911, and patent number 256606 was granted on 17 February 1913. Two years later he filed for a patent on the “automatic sight” loaded chamber indicator (8 January 1913) and patent number 271863 was granted on 19 March 1914. The first variant has a pop-up rear sight that serves as a loaded chamber indicator. There is a rib along the top of the slide with a rippled non-glare finish and a small front sight dovetailed into it. The slide has a long longitudinal cut on its underside in the very center that extends from the front edge of the ejection port all the way through the breech block to the rear of the gun where there is a lateral slot across the rib for the rear sight. A long lever fits in the longitudinal slot, held in place by a screw at the front of the breech block, the lever pinned at the front, with the rear sight at the other end. When there is a cartridge in the chamber of the gun, the rim of the cartridge lifts the lever up and raises the rear sight so it is visible. It can also be easily felt in the dark. I believe that all first variant pistols have a magazine safety, but I do not know this for certain. If you have a Model 2 with the automatic sight and would be willing to share photographs and information, please write to me. Dieter Marschall, author of Walther Pistols: Models 1 Through P99, confirms that he has examined several first variant pistols with a magazine safety, but he cannot confirm that all of them have it. The magazine safety mechanism consists of a small spring-loaded semicircular-shaped bolt that is pushed out when the magazine is removed to depress the connector and disconnect it from the sear. When the magazine is reinserted this bolt is pushed back into its well and out of contact with the connector. Kersten states, “[t]his version was seldom produced due to the added cost.” It certainly required considerably more machining and assembly time, and was probably discontinued due to lack of demand. Marschall has documented serial numbers for the first variant that run from 1100 to 19058, but since serial numbers are in the same series as the second variant total production of the first variant may only be a few hundred to a few thousand pistols. The first variant is quite scarce. The second variant has no rear sight at all--merely a groove down the top of the slide with a tiny front sight that does not rise above the sides of the groove. This is the most common Walther Model 2 pistol. The gun has no magazine safety. Gangarosa, in his book The Walther Handgun Story, implies that early Model 2 pistols all had the rear sight loaded chamber indicator, which was later eliminated because it was too expensive to manufacture. 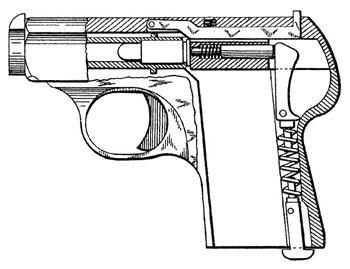 However, Kersten, in his book Walther, The German Legend, states clearly that: “Walther produced this pistol in two versions.” Kersten quotes from an unidentified document about the Model 2 written by Fritz Walther: "The following description is ... not only true for the pistol with automatic sights, but also for the pistol with a sight groove. ...two models in the same caliber... A very important and outstanding innovation is the automatic sight system, which is one of the features of this model. ... Of highest importance is the magazine safety of this model, which is designed so that the pistol is secured as soon as the magazine is removed." These quotes not only indicate that the two variants were available simultaneously, but that the one with “automatic sights” also had a magazine safety. Marschall has documented serial numbers for the second variant that run from 1770 into the 70000’s. 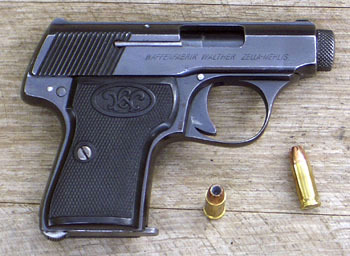 Walther essentially took the Model 2 and moved the serial number to the other side and renamed it the Model 5. Very soon thereafter they changed the slide serrations. The earliest Model 5 pistols retain the broad slide serrations and the early Zella St. Blasii address, but these are quite scarce. The vast majority of Model 5 pistols feature 16 fine triangular-cut serrations at the rear of the slide. The address on the right side of the slide is WAFFENFABRIK ZELLA-MEHLIS. The left side slide legend says only WALTHER’S PATENT CAL.6,35, with the Walther banner beneath. According to Gangarosa, the Model 2 had four grooves in the barrel, whereas the Model 5 had six, but Kersten says the exact opposite, and Marschall says that either model may have 4 or 6 grooves. The Model 5’s are said to be better finished than the Model 2’s, but this can be difficult to distinguish on old pistols, depending on their state of preservation. The first variant retains the sight groove on top of the slide, with a tiny integral front sight that does not rise above the sides of the groove, and also the more-or-less oval-shaped ejection port of the Model 2. As best I can tell, the serial numbers were continued from the Model 2 and began in the 60,000 range, running up into the 89,000 range. With the second variant of the Model 5 the curvature of the top of the slide was altered slightly, and the shape of the ejection port was altered from the earlier oval shape to a more squared- off shape, but still with rounded corners. Most importantly, a rib was added to the top of the slide, similar to the one on the first variant of the Model 2, with a rippled non-glare finish and small integral front and rear sights. The second variant was probably introduced after the end of the First World War. Marschall indicates that the rear portion of the barrel, where the chamber is located, on the later Model 5 was a couple- hundredths of an inch thicker than the rest of the barrel (0.37 inch as opposed to 0.35 inch). I do not know if this change was made at exactly the same time as the other second-variant changes, but I suspect it was. At some point the design of the magazine release catch was changed slightly, and I assume this change also took place with the advent of the second variant. Serial numbers ran from the 90,000 range into the 110,000 range. Marschall indicates that there were two groups of serial numbers after the war in the ranges from 250,000 to 270,000 and 350,000 to 390,000. I have not seen any serial numbers in the 200,000’s, but my sample remains relatively small. The Walther Model 7 was a .25 caliber pocket pistol produced during the war concomitantly with the Model 5--it was simply a larger version, with a longer barrel and greater magazine capacity, but it was only produced for a short time. 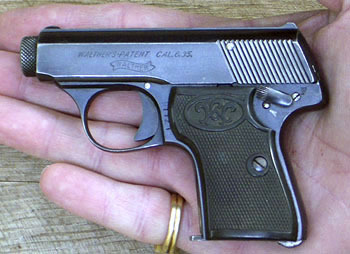 The Walther Model 8 .25 caliber pocket pistol appeared in 1921 as a replacement for the Model 7, which had probably already been discontinued, and the Walther Model 9 vest pocket appeared in 1923 to replace the Model 5, though both guns were available until existing stocks of the Model 5 were exhausted. The entire line of Walther pistols from the Model 2 through the Model 7 are of a similar type: blowback operated, with a fixed barrel, concentric recoil spring, a concealed hammer, and a positive safety that locks the hammer when cocked. The recoil spring of the Models 2, 3, 4 and 5 is held on with a bushing at the front of the barrel, much like the 1910 Browning, which almost certainly influenced their design. The rear of the spring fits into a sleeve that prevents the spring being visible in the ejection port of the slide, and also helps prevent dirt from getting into the works. A lot of people misassemble the guns with this bushing on the front of the spring, which leaves the spring visible in the ejection port. I measure my Model 5 at 4.3 inches long by 3.1 inches high. It was the smallest vest pocket .25 until the advent of the Model 9.
at 10 yards measures 1.25 inches. Press in on the barrel bushing, turn it counterclockwise when facing the front of the gun and draw it carefully off the end of the slide--it is under pressure from the recoil spring. The Model 5 is exquisitely well made and a pleasure to shoot. It is reasonably accurate out to 20 feet or so. 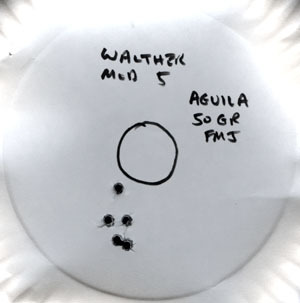 Having owned 15 or more different .25 caliber pistols over the years, I have come to the conclusion that the Walther Model 5 is my overall favorite. It has good ergonomics, good accuracy, and is very reliable. “Eine neue Generation,” by Gerhard Ortmeier, M.A. Deutsche Waffen Journal, October 2016. Famous Pistols and Handguns, by A.J.R. Cormack. Profile Publications, Berkshire, England: 1977. Walther, A German Legend, by Manfred Kersten. Safari Press, Long Beach, CA: 2001. Walther Pistols: Models 1 Through P99, by Dieter H. Marschall. Ucross, Los Alamos, NM: 2000. Walther Volume III, 1908-1980, by James L. Rankin. Privately printed, Coral Gables, FL: 1981.
knowledge of Walther Pistols. Thanks also to Earl Mount for sharing information.